The leaves are falling! It's time to put away most of the garden tools and take out the bamboo rake. We still need to mow the lawn a few more times, until the constant rains make it impossible to cut the grass. Time to prepare for our hibernation indoors until spring. Well, not for this gardener! Autumn can be an extraordinary time in a Northwest garden, full of the vibrant hues of leaves, flowers and berries. When September rolls through your life, it's not time to give up on your garden. You can plan a fall garden that will put even a spring garden to shame. So let's roll up our sleeves and get ready to design a beautiful, bountiful fall garden. The first thing you need to do is take a walk through your garden at several different times during the fall. Take with you a pad of paper and a pencil. Note what is still in bloom, and the plants and trees that are turning colors. Make a note of what really catches your eye--what colors you enjoy the most in the garden each time. A rainy day is a good time to take note of what you can see from inside, looking out the windows. This is important since most of your days from the middle to later part of fall are spent indoors. The gardens you see through the window, or on the way to the car, will be equally important to plan fall and winter plantings that are colorful and fragrant. The second task you should do is take trips to the nursery or public gardens. Look at what is in bloom, and take note of the leaf colors of shrubs, perennials and trees. Cruise your neighborhood, looking for autumn interest that catches your eye. Take your camera with you, and snap photos of what you see and like about the fall colors. This also helps when you see a plant but don't know what it is. You can take the photo with you to your favorite nursery, they will help you identify the plant. These are great ways to get ideas for the autumn garden. Another way to gain ideas for your fall garden is going to the public library and checking out garden reference books. Books for our region, such as the ones published by Sunset Books, can help a lot in the planning, especially if you are a beginning gardener. Two invaluable references for Northwest gardening are Sunset Western Garden Book and Sunset Western Landscaping. Another book to add to your garden library is My Garden in Autumn and Winter from Timber Press. The author, E. A. Bowles, walks you through the off-season garden with plant lists and ideas to keep your garden lively looking, not with the appearance of being asleep in the cold. It's time for me to get busy and give you a few ideas for your autumn garden. Let's start with trees, since most of us think of tree leaves and color when we think of autumn. One of my favorite trees in autumn is our native Vine Maple, Acer circinatum. Many of us enjoy their show when we travel the Cascade Mountain passes in October. Vine Maples dress the mountain sides with fiery colors every fall. These trees can take many forms in our gardens, depending on the way we grow them. In the shade of conifers, they take on their vine-like qualities. In full sun, they behave like a small tree. They can be planted on a shady north side of a building and espaliered. By choosing them in fall, you can select the trees for red, orange, or yellow fall colors. Here's a list of Maple trees for fall color. Another of my favorite trees is the Dogwood tree. Cornus adds beauty to my garden year round. Cornus controversa (Giant Dogwood) grows quickly to 40 to 60 feet and needs full sun to get the best autumn color of bright (need your sunglasses) red. For a smaller yard, Cornus kousa 'Moonbeam' grows to 22 feet tall x 15 feet wide and has excellent fall colors, deep crimson-purple leaves, plus red fruit. Add the ornate and enormous seven-inch flowers in spring and you can't ask for much more in a small tree. I encourage you to consider one of the many Cornus trees for your garden. Although I have not grown Stewartia, it is definitely one that I would like to grow. Not only would I enjoy its autumn colors, but also its showy flowers and peeling bark, making it simply an all-year-round great tree. Quite a few are very large trees, reaching 70 feet tall, but S. ovata grows to 20 feet. I might find room for this one yet. Its autumn colors are orange and red. In late summer it flowers with rose-like white flowers that are 4 inches wide. Definitely S. pseudocamellia would be one to choose for fall color. 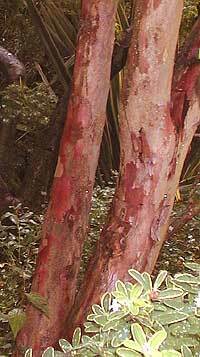 Its bark looks painted with splashes of orange, green and white paint. Beautiful fragrant flowers in summer and orange leaf color in autumn make this another great year-round tree. "Conifers?" you ask, "Conifers are evergreen; how can they have autumn colors?" Well, give me a chance to explain! Yes, most are evergreen, but many come in varied colors. Some conifers change colors during fall or winter. Some conifers such as Metasequoias shed all their leaves in fall. Many conifers have colorful foliage beyond green, all year round. A grouping of dwarf conifers in colors of gold, blue or green can be quite striking in the year-round garden, even more so after the leaves of other deciduous trees fall and color diminishes in the garden. Some have foliage (scales) that slowly change from green to a soft yellow, such as the 80 feet tall Cryptomeria japonica 'Elegans Aurea', in late fall to winter. A small one at 4 feet tall by 2 feet wide, Cryptomeria japonica 'Bandai' turns from green to bronze in autumn. C. japonica 'Elegans Nana', with plum colored foliage, stays dwarf, reaching a mature height of six feet tall. C. japonica 'Yoshino' grows quickly to 30 feet, with blue-green foliage that turns bronze-green when cold weather sets in. Another cryptomeria, 'Sekkan', grows 15 feet tall and is stunning with its yellow-white variegated leaves. Not convinced yet? Chamaecyparis might be the conifer that will convince you. They come in tall shapes, short shapes, skinny shapes and fat shapes, even twisted and weeping shapes. Some have hues of gold or blue or green, some are variegated, some have flecks of gold. 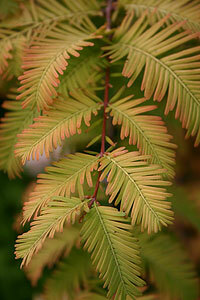 If you have not seen a Chamaecyparis before, you will be amazed at how beautiful they are. In the garden they add structure year round, and in fall and winter they make the garden really beautiful.